Mary joined Patton & Ryan after serving as the County Clerk and election official for McHenry County. With a significant amount of trial experience, Mary has served as lead attorney for class actions, civil rights matters, and labor and employment in federal court. She served four years with the Cook County State’s Attorney’s Office a year with McHenry County State’s Attorney’s office both in the civil division and five years of insurance defense. Mary has tried over ten civil jury cases in both Federal and State Courts; 50 bench trials in the state courts of Illinois. 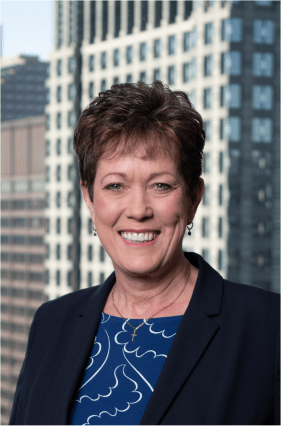 Before being admitted to the Illinois bar in 2004, Mary worked for a large law firm in Chicago as a paralegal, in the litigation and environmental practice groups where she handled complex litigation and insurance defense. During law school Mary served as a law clerk for the following; Judge, Maureen Durkin-Roy, Cook County Law division; Judge, Charles P. Kocoras, Northern District Court of Illinois, and United States Attorney’s Office Northern District Court of Illinois, Western Division. Mary’s civil practice focuses on the defense of catastrophic personal injury and wrongful death, trucking and transportation litigation, municipal defense and general civil litigation defense. Mary is continually seeking new opportunities to serve the firm’s clients. Before Law School, Mary and her husband ran a small local trucking business and likes to fish and go boating when she is not working.